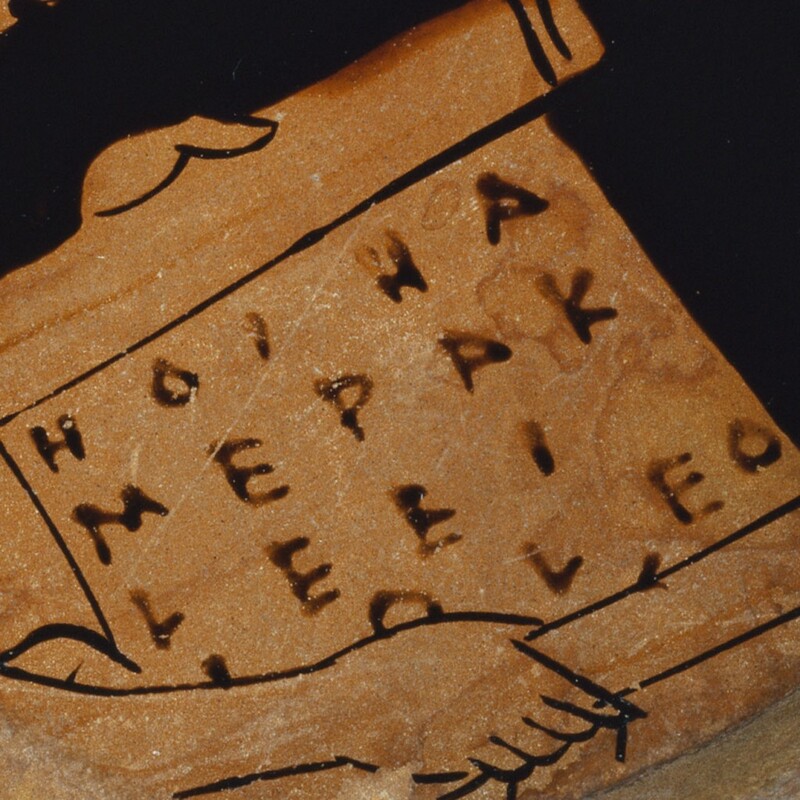 The Getty Tumblr recently featured a fabulous Athenian pottery fragment that depicts a boy reading a scroll. Readers were curious to hear more about what the letters mean and how we know. Here’s the word from antiquities curator David Saunders. The first three words translate along the lines of “the men with Herakles.” As for that last word—if we’ve deciphered it correctly (only part of the initial I is actually marked, above the boy’s arm)—that could be the name of Iolaos, Herakles’ regular companion—the Robin to his Batman. You can find the duo in action together on another vase in our collection, fighting against the multi-headed Hydra (their names are inscribed there too, but in the Doric dialect). 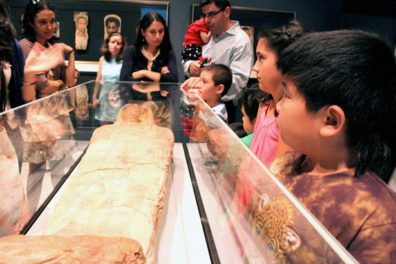 So, from this interpretation of the few words on the scroll, it looks as though this young boy is reading an epic tale. It’s a text that involves Herakles leading some sort of expedition, and the men accompanying him are named, Iolaos first among them. There’s something comparable to this in Homer’s Iliad; much of Book 2 comprises the “Catalogue of Ships,” a listing of all of the Greek troops who came to fight at Troy. As an undergraduate, I remember grimly working my way through these lines—a litany of often-obscure names and epithets, place names and patronymics—and so I can sympathize with the young boy on our fragment. But the learning and reciting of texts would have been a key element in a youth’s education in ancient Athens, and we see other scenes where young boys are reading or reciting from scrolls. Doing so was important not only for developing literacy, but also for learning the achievements of the mythical heroes and seeking to emulate them. In fact, the performance of such recitations was an art form in itself, even a subject for competition, and we sometimes find vases that show men singing lines of verse out loud, such as on this amphora in the British Museum. This would be a line from Hesiod’s Catalogue of Women, a genealogical poem that describes the family trees of many mythical heroes. It only survives in scraps, and this line would refer to Iole, whom Herakles claimed as his bride after successfully winning an archery contest. This little fragment thus opens a window on the difficult task of epigraphy, the study of inscriptions. More broadly, it’s a valuable reminder of how much is lost to us. 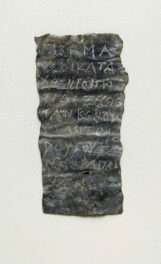 Papyrus scrolls were a primary medium for the writing of texts in the ancient Mediterranean. Because of the perishable nature of the material, however, they survive today only under very particular conditions (dryness being key). One instance was following the eruption of Mt. 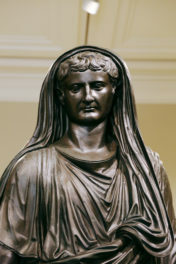 Vesuvius in A.D. 79. When excavators at Herculaneum in the 18th century encountered a huge villa, one of things that struck them most was its library of carbonized papyrus rolls—so much so that they called it the Villa dei Papiri. That building was the model for our own Getty Villa, and so as our Athenian youth (and this curator) struggles with his Greek text, I like to think he’s doing so in a suitable setting. Inscriptions on Greek pottery are a fascinating field of study. If you’re interested in the Greek alphabet itself, a great resource is Henry Immerwahr’s Attic Scipt: A Survey (1990). His book is the result of a lifetime’s research, and his database of inscriptions on vases can be accessed through Rudolf Wachter’s Attic Vase Inscriptions website, and also the pottery database of Oxford University’s Classical Art Research Centre. On the scrolls themselves, see Henry Immerwahr’s articles “Book Rolls on Attic Vases” in ed. C. Henderson, Classical, Medieval, and Renaissance Studies in Honor of Berthold Louis Ullmann 1 (1964), 17–48 and “More Book Rolls on Attic Vases,” Antike Kunst 16 (1973) 143–147, and also, recently, David Sider, “Greek Verse on a Vase by Douris” Hesperia 79.4 (2010), 541–554. For good introductions to ancient literacy and education, I can suggest Eric Havelock, The Literate Revolution in Greece and its Cultural Consequences (1982), Kevin Robb, Literacy and Paideia in Ancient Greece (1994), and R. Cribiore, Writing, Teachers, and Students in Graeco-Romano Egypt (1996). An informative, well-written, charmingly autobiographical text – thanks so much!